Nintendo 3DS comes in Aqua Blue, Cosmic Black, or Flare Red. In a world where smart phones are designed to do a little bit of everything, it’s easy to overlook gadgets with a dedicated purpose. But for high quality portable gaming, it’s hard to do better than Nintendo’s handheld systems. The latest release, Nintendo 3DS, provides a brilliant portable gaming experience complete with innovative new features, multimedia options, and plenty of engaging games ranging from quick and easy to elaborate adventures. 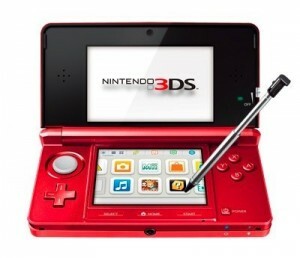 The first thing that distinguishes the 3DS over other similar products and its predecessors is the 3D technology. Sure, it seems like a bit of a gimmick at first, but when I see the landscape before me recede into the distance with believable depth, the game comes alive in a whole new way. The downside is that the 3D effect doesn’t work that well in truly portable settings. In the car, on the bus, or on a train–typical places for quick game sessions–cause too much movement and disrupt the effectiveness of the 3D image. In fact, the 3DS requires a rather specific angle to see the 3D properly, so sometimes it’s a little more effort than it’s worth. In addition, the 3DS features a gyroscope for motion controlled gaming, a fun new way of integrating yourself into the game, but again this is more often than not a disruption to the 3D image. When it works, the 3D effect is great, but there are plenty of hurdles along the way. The good news is that it’s completely optional, and you can turn it off at any time. 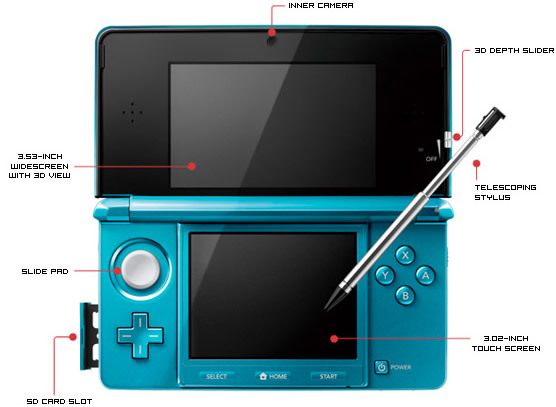 A quick run down of the parts on the 3DS. The single most important aspect is of course the game selection; the multimedia features are side dishes, the games are the main course. If you had asked me six months ago I wouldn’t have said the game library was worth it–even for die hard video game fans would be hard pressed to find quality games to sink their teeth into. However, this holiday season has bolstered the 3DS library with top notch and recognizable games including Super Mario and soon to be released Mario Kart. The past few months have built up a respectable selection of games, plus the Nintendo eShop is in full swing, giving you the ability to download games directly to the 3DS. There are already dozens of great games to download, and each week adds more, including classic GameBoy games for you to relive childhood memories or help your own children create their own. With the variety it has now, the 3DS offers a little bit for everyone, no matter what type of game you enjoy. Though not as robust as the games themselves, the 3DS branches out with a few extra features including a camera, music player, and even the ability to play Netflix Instant Watch videos. None of these are replacements for proper media gadgets–the camera, for example, is incredibly low quality, meant only for viewing on the 3DS–but they add a little spice to the system. Generally, these are features you might use once but will quickly forget about. The one redeeming feature is the ability to take 3D images with the camera, but even this doesn’t elicit much interest. 3DS already has many great games such as Super Mario 3D Land with more on the way. The biggest problem with the 3DS comes down to the battery life. If you’re playing a lot, especially with the 3D effect turned on, the battery will run down in a matter of five hours or so. When using the 3DS out and about, you have to be careful of just how much battery you have left which is an inconvenient factor to keep in mind while you’re playing. Despite the poor battery length, the Nintendo 3DS more than delivers as a source of nigh endless portable gaming. The 3D effect is novel when it is working well, and the selection of games is both excellent and still growing. The 3DS now comes in blue, black, and red. At $179.99, it’s a great time to invest in the 3DS for a unique and rich game experience.